"I greet you with such Joy and, yes, you are my Beloved Children! 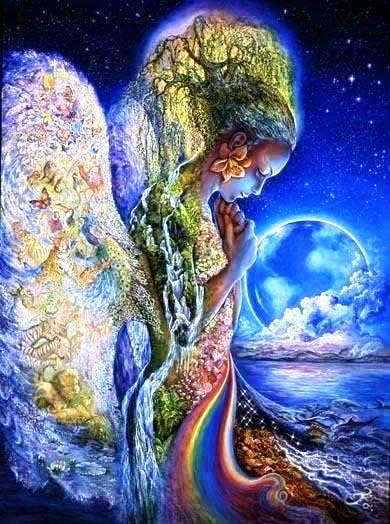 I am Mother Gaia, Mother to all of the Kingdoms here of Planet Earth - below, on and above. My Kingdoms are vast, as you know. And I am most particularly in the process - my own Mission process you might say - of reuniting all of my children in all of my Kingdoms to come together in the Oneness of pure LoveLight. "Yes, there are changes going on. Yes, there is fear in the World. I offer you this invitation, and I know that you are standing together already, and this is most Joy-full! But this invitation is for all members of all of my Kingdoms, so perhaps you will take it into your Hearts and offer it to someone that you see to be in fear - or simply in ignorance - of what it is that we are doing together. "Beyond that, I invite you to enjoy what we call Communion with me. I remind you that I simply have great healing and restorative powers! Picture yourselves - perhaps at the seashore, or poised upon a giant rock above a deep pond, about to dive in as a younger one, with all of the excitement and the enjoyment of the child, or youth, as the younger adults are called. Bring yourselves out into a perfect moment that you have enjoyed and re-connect! Allow yourselves to be as innocent as children!!! "Trust in yourselves to know how special you are, how Divine You Are, and then embrace or engage with the energies of all that I offer you! The flowers – stop and smell the roses; the trees – give a hug to that one that you are specially drawn to; the animals of nature - do as one Beloved Member of our Family has begun doing. Converse with the birds, by imitating first, and soon coming to understanding and actually conversing! And, by the way, you can converse with any members of my Family, whether you are in the same outdoor setting or indoor setting together, or even whether you are apart, on the other side of the World from each other!!! "And let us consider those Kingdoms of mine which have gone into hiding through the years. They did so in order to preserve themselves for this moment, this Homecoming! We shall speak particularly of the fairies and all the wee-folk. We shall speak particularly of the ones you call 'the Bigfoot' or the 'Sasquatch,' the gentle ones. Remember Chewbacca in Star Wars, a gentle giant. Yes, he could defend himself when he needed to, but these gentle giants of Planet Earth prefer to stay in hiding, only to be showing themselves to those who come with the innocence and the trust of children, and with the Love shining from their Hearts! "It may be that there are animals that you have always considered to be real only in your imaginations, or your 'fairytales.' Where do you think the fairytales came from? They came from a time when there were fairies everywhere! No, they did not always show themselves to those people who would have persecuted them in some way. And eventually it came that there were so many persecutors that they went up into a Higher Dimension. "Where do you think Avalon is? Did Avalon simply vanish from the Earth? What about Camelot? Those two were present and still are. It is to find them again!!! What about the great temples of Atlantis and Lemuria? Are they all gone, vanished from the Earth? They are re-emerging, as are the giant crystals. They are being found, known about and they shall indeed come forth as YOU bring yourselves to meet them!!! "And that is why I have come, my beautiful, radiant Children! It is not only to beam the LoveLight upon your past experiences - to savor those which are the most Joy-full in your memories, to let go of the ones that were not so Joy-full, or to transmute them so that you realize that you have gained the wisdom from them and no longer need them in your memories, in your energy fields. It is to move yourselves up!!! It is not as easy to communicate with the flowers and the trees and the animals of the forests and the seas and so on, even with the minerals - although they are the ones who seem to be most adept at conversing with more members of Humanity in some way, for they are natural messengers, sending and receiving! "But you have the abilities to communicate with all of my Kingdoms! It is to bring yourselves into Higher Realms, to let go of the restrictions, and the challenges, and the old 3D ideas and programs, to lift up and to begin these conversations whenever you feel so to do!!! "You can invite any Kingdom members to the Council Meetings of which Ashtar spoke! ** All of my Kingdoms are represented by Spirits and Devas. You can invite, for instance, the Deva of the Carrots to come, if you wish to plant some carrots in your garden and perhaps get some wisdom about some ways to nurture them from the Deva who represents them. "It is for you to explore and expand yourselves into these experiences and as you do, you will find that it will greatly enhance and empower your journeys into permanent residence in Higher Dimensionality. And I shall be there to welcome you, as I am with you now! "And it is to add from my Kingdoms to your healing teams, if you so choose. There is a special procedure brought forward by the woman who gives the procedures for MAP healing sessions,*** and that does involve representatives from my Kingdoms. Or simply go out with your feet bare onto the ground. Touch the earth or the grass with your bare feet and feel the healing power there - the grounding power, the balancing power! "There are many, many who utilize particularly, the healing capabilities of the crystals and the plants! Allow yourselves to connect in. It's all there for you, Beloved Ones. It's all there for you to access, and at the same time to take responsibility for its well-being!!! If you pick a flower, greet it with thanks, and bring it closer to yourselves - perhaps to adorn your body or to lend its healing energy to the inside of your home. "If you choose an animal to be a companion to you, shower it with Love! You all know how much healing power you will find when you bring an animal in to your home and bestow upon it the status of being a Beloved Member of your Family! "And by all means, keep a crystal in your pocket if that is how you choose to keep your connections empowered. "And so, my Beloved Children, I bless you. I see your radiance. I join with you in Love, for truly we are finding that which you promised yourselves so long ago - the Path to Home, the way for all of us of Planet Earth, and beyond! And so I thank you for being Who You Are, for letting your Lights shine so bright, and for allowing yourselves to renew and restore and refresh yourselves with the Loving Energies I hold for all of you - nevermore to be separate or apart from each other, because now you shine for the Truth of Who You Really Are - my Beloved Children of Divine LoveLight! And so it is. Namaste unto all and Blessings of Love, and of our Loving Communion, forever!"